Canola Oil is considered to be a healthy vegetable oil that is derived from pressing the seeds of the Canola Plant (developed from the Rapeseed). It originated in Canada where it was called "Canada Oil, Low Acid" from which the name Canola is derived. Canola oil is great for cooking. It is low in saturated fats and high in monounsaturated fats. It also provides a good source of Omega 3 and 6 fatty acids. Canola Oil is Yellowish Clear and Slippery. Canola oil is low in saturated fat, is high in monounsaturated fat, and has a beneficial omega-3 fatty acid profile. The Canola Council of Canada states that it is completely safe and is the "healthiest" of all commonly used cooking oils. It has well established heart health benefits and is recognized by many health professional organizations including the American Dietetic Association, and American Heart Association, among others. Canola oil has been authorized a qualified health claim from the U.S. Food and Drug Administration based on its ability to reduce the risk of coronary heart disease due to its unsaturated fat content. Food complements: Chicken, Pork, Beef, Vegetable. Choosing: Choose Canola Oil properly by looking at its content. 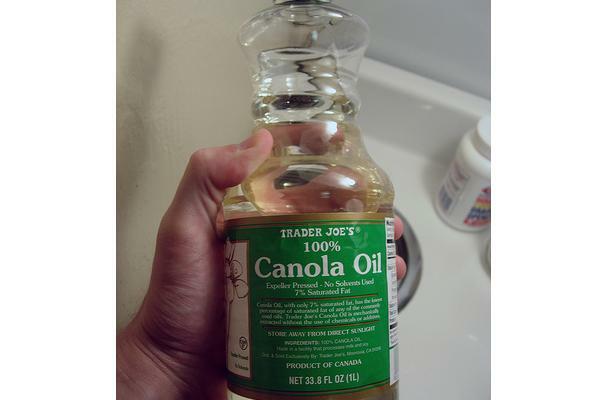 Do not buy canola oil (or any other oil) with unidentified floating particles. Check for broken or damaged container. Do not buy display products because they are most exposed to direct sunlight which can affect the quality of the oil. Also check for expiration date that can be found outside the container. Oil takes time to expire but it doesn't hurt to check the expiration date. Buying: You can get you Canola Oil at your local Grocery Store. Canola oil is produced from pressed canola seeds. This seed is harvested from pods, particularly in North America, with North Dakota accounting for 92 percent of U.S. production. Canola is a type of rapeseed; however, it has been adapted to get rid of potential undesirable qualities of rapeseed, such as erucic acid. In 1985 the Food and Drug Administration certified canola as safe for human consumption. It is a popular oil due to its high levels of unsaturated and omega-3 fats. It is also popular among cooks due to its high burning temperature. Precondition the seeds with a grain dryer unit for direct heating. Spread the canola seeds evenly on the grain dryer unit. Remove the cooling section from the grain dryer unit, and apply gentle heat over 30-45 minutes at 86 to 104 degrees Fahrenheit for uniform heating. Due to the often cold temperatures in which canola is grown it was found that preconditioning or heating the seed produced much better oil extraction conditions. Roll or flake the seeds. To extract the oil the cell walls within the seed must be ruptured to allow the lipids to migrate to the outer layer and thus be extracted. Roll the preheated seed or flake between two smooth cast-iron rolls. The rolls should be between 500 to 800 mm diameter and 1,000 to 1,500 mm long. The rolls rotate with one operating at a higher frequency than others allowing abrasion between the roll surfaces which allows the seeds to be sheared as they pass through. The rolls should be equipped with scrapers to prevent the seeds from sticking. Cook the canola flakes in a stacked oven with five to eight steam-heated tray bottoms. The oven should be equipped with a rotating arm just above each tray for stirring as well as a chute mechanism which allows flakes to pass between layers allowing seeds to heat evenly. The cooking process should take place at controlled temperatures between 100 and 140 degrees F.
Press the seeds until cake fragments form. This should be done in either screw presses or expellars, which are mechanized machines for crushing. This method reduces the lipid content from 42 percent to between 16 to 20 percent. Screw pressing or expelling also condenses the seeds into a dense substance known as "cake fragments." Extract the oil from the cake fragments using hexane extraction or cold pressing. The hexane extraction process involves maximizing contact between the cake fragments and hexane (0.12 percent hexane concentration -- 1 g hexane/100 g flakes -- and incubation for 12 hours at 122 degrees F) through a series of soakings or washings. This is the common method of oil extraction and is used to supply the bulk of canola oil in the marketplace. Extract the oil from the cake fragments using cold (expellar) pressing. This is the mechanical pressing of the cake, again using screw presses or expellars which mechanically crush the cake fragments. This crushing is done at a slow pace to avoid raising temperatures. This process produces a lower yield of oil, typically 75 to 85 percent. Its cost is usually higher and and it has a stronger smell and flavor. A commercial oil expellar has a production capacity of 300 kilos per hour of raw material. Use when frying Pork, Chicken, Beef or Vegetables. Cleaning: Cleaning new canola oil isn't something to do. But recycling canola oil requires straining. Use a metal or cotton strains to remove small particles off from your used canola oil. Let the used canola oil cool to room temperature before handling it. Position a strainer over a small bowl. Lay a coffee filter over the strainer. Pour the cooled canola oil onto the coffee filter and into the strainer. Discard any solid food particles or chunks in the strainer. Transfer the strained canola oil into an airtight container. Keep in the refrigerator to prevent the oil from becoming rancid. Discard the oil from your refrigerator when it starts to darken and change colors (which could be a sign of too many food particles) or if it starts to have a distinctive odor. Smell and taste the canola oil before reusing it. It is rancid if it smells or tastes bitter or sour. Never use canola oil if it still contains food particles because they can burn and smoke when you heat the oil. Africa: In the South of the Republic of South Africa,Canola was planted for the first time in 1993 in the region called the Overberg near the town called Swellendam. Swellendam's farmer's Co-operative, SSK- Sentraal-Suid Koöperasie started a oil refinery called Southern Oil Limited(Soill),according to the Afrikaans newespaper Die Burger's article on the 24/07/2009 it is the only Canola refinery in South Africa and refines about 3 500 tonnes per month. History: Once considered a specialty crop in Canada, canola has become a major North American cash crop. Canada and the United States produce between 7 and 10 million tonnes of canola seed per year. Annual Canadian exports total 3 to 4 million tonnes of the seed, 800,000 tonnes of canola oil and 1 million tonnes of canola meal. The United States is a net consumer of canola oil. The major customers of canola seed are Japan, Mexico, China and Pakistan, while the bulk of canola oil and meal goes to the United States, with smaller amounts shipped to Mexico, China, and Europe. World production of rapeseed oil in the 2002–2003 season was about 14 million metric tons.